Paperback, 7 x 9.5 in. / 288 pgs / 78 color / 30 bw. Edited by Carson Chan, Fredi Fischli, Niels Olsen, Linda Schädler, Filine Wagner. Text by Carson Chan, Esther Choi, Kevin Lotery, Spyros Papapetros, Fanny Singer, Hadas Steiner, Filine Wagner. The starting point of this publication is the conceptual encounter between English Pop artist Richard Hamilton (1922–2011) and Swiss historian and architecture critic Sigfried Giedion (1888–1968), famous for his landmark 1941 book, Space, Time & Architecture. In 1949 Richard Hamilton created the Reaper print series as a reaction to Giedion’s 1948 book Mechanization Takes Command, in which he describes the mechanization of everyday life. Reproducing Hamilton’s complete Reaper series alongside illustrations created by Giedion plus related images, this publication brings together seven essays by renowned international scholars. 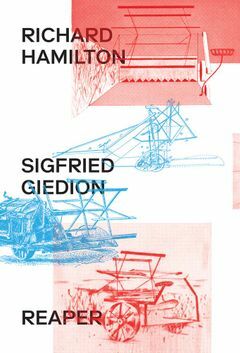 Among the many topics discussed are Hamilton’s early works and exhibition installation practice, postwar British biotechnology and architecture, “Hippie Modernism” and the visual strategy of Giedion’s books. FORMAT: Pbk, 7 x 9.5 in. / 288 pgs / 78 color / 30 b&w.